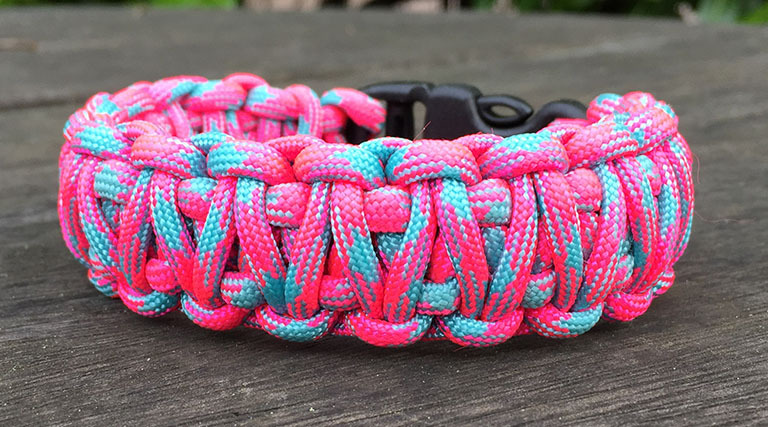 We often get asked if there are kits so you can make your own paracord bracelets. Well the answer is now Yes you can! 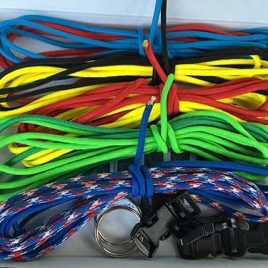 These paracord kits represent real value for money and will save you quite a lot compared to buying them individually. We have put together some great colours which we think you’ll like.However, you don’t have to take these, you can always pick your own colours. We also have a superhero kit, where we have a prejoined two colours together in popular character colours, e.g. black/yellow – Batman, Red/Yellow – Ironman. 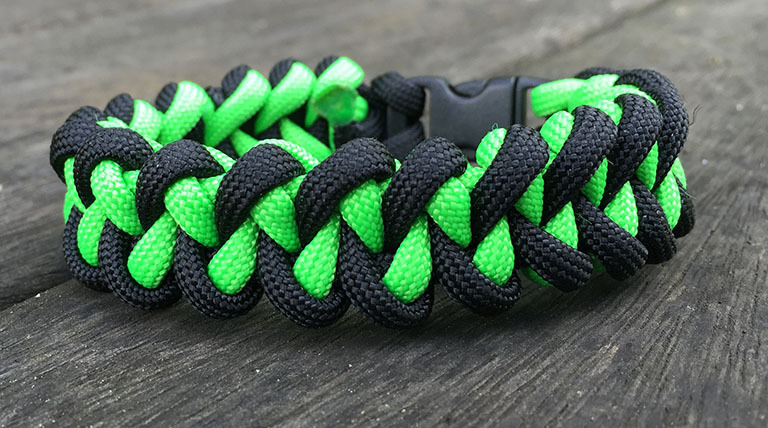 Please be aware these kits are made with 100% US 550 Paracord which is either military or commercial spec. It is far superior to the cheap Chinese stuff which inhabits eBay and many sites. Our kits are not toys, although kids love them. We don’t mess around with the glossy packaging, we prefer to put that cost into the product so you’re happy. Supplied in a simple storage box which is biodegradable once finished with we use minimal packaging to help the environment. What can you make from the kit? 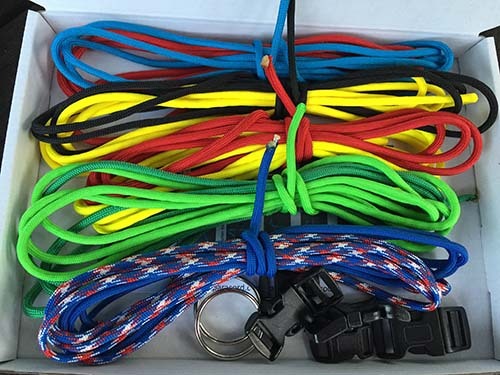 In each kit you’ll get 5 x 10ft lengths of genuine US 550 Paracord from a GSA Aprroved contractor. You’ll also get 2 x 15mm, 3 x 10mmm side release buckles and two split rings. 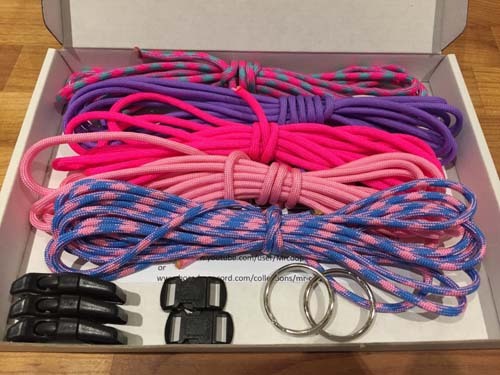 There are two sets of instructions in the box for you to make a cobra and also a jawbone design. 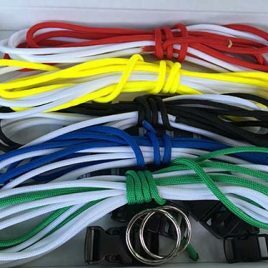 All this means you can make five paracord bracelets of single colour, or half the lengths and join them to make a double colour bracelet. 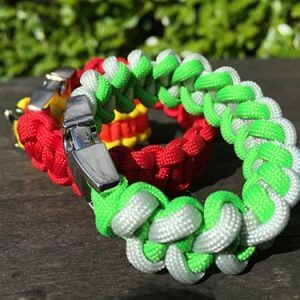 For most bracelets you need to allow about one foot paracord for one inch bracelet and this means you will probably have some leftovers, but not enough to make another bracelet. Your options for these bits are to use them in another bracelet as a chaser, or use the split rings to make your own key rings. Even the smallest pieces can be used and made into zip pulls. These kits are great for kids as well as adults. Swap colours and designs with friends for 1000’s of combinations. Pick one of our SurvivalBands combo packs where we have selected five colours for you, or pick our theme packs such as: The SuperHero pack which contains fivex 10ft lengths of paracord, of joined colours (2 x 5ft lengths) This pack means you can make you SuperHero wristbands in colours inspired by characters such as Batman (black/yellow), Hulk (Green/NeonGreen), Ironman (Red/Yellow), Spiderman (Blue/Red) & Captain America (Red,White&Blue/Blue The Ranger pack similar to the Superhero packs makes wristbands inspired by Power Rangers (Red/White, Yellow/White, Blue/White, Green/White, Black/White). The Tactical Camo pack contains Desert Camo, Woodland Camo, Blue Camo, Black & Coyote in Single 10ft lengths The Friendship Pack contains Neon Pink, Rose Pink, Purple, Baby Shower & Cotton Candy. The price of the kit represents true value for money. 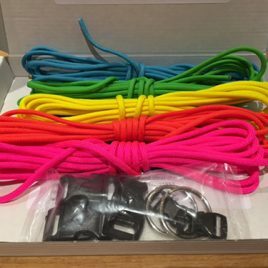 Now you can make five top quality wristbands for less than you buy them on Ebay and have the fun doing them. Swap them with your friends, or mix their colours for 1000’s of other colour combos. If you ever get bored with them keep them somewhere for that time when you need a length of cord. 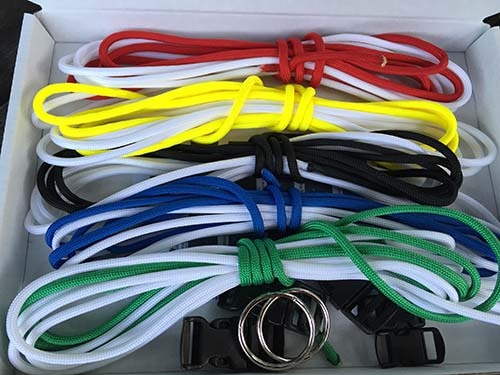 Happy Paracording. 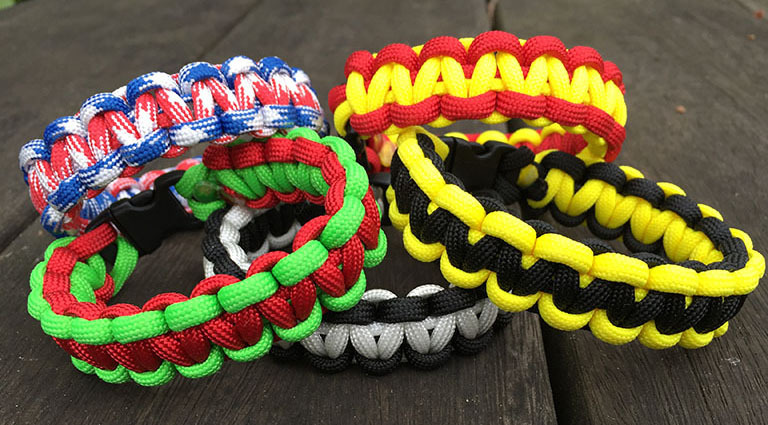 A popular weave for paracord wristbands. Single, double, even triple colours. Pick your favourite character, choose your football team or just be an individual. 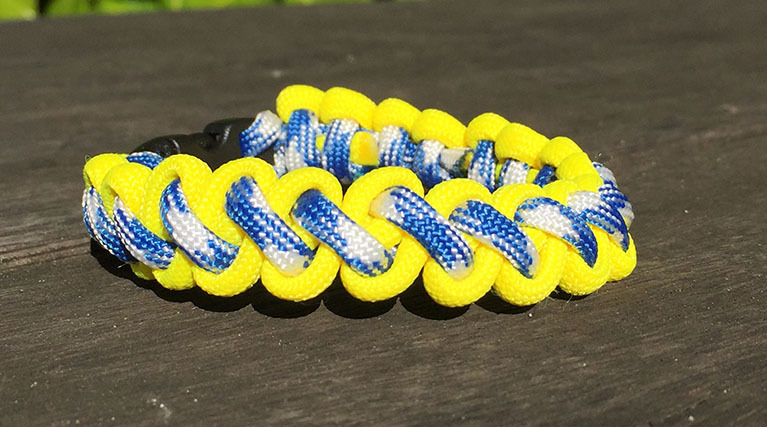 This paracord wristband is a light weight bracelet which weaves up really tight making it quite thin, yet rounded. Can also be made as a SurvivalBand Anklet. 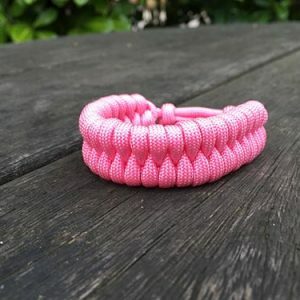 Mid weight paracord wristband with an attactive, yet agressive look. Available in Single or double colour.